Date Posted: January 15, 2019 Category: AMCC Blog Tags: Pick.Click.Give. AMCC is a grassroots organization working statewide to stimulate progress and solutions to protect marine habitat, minimize bycatch, and promote viable, community-based fishing opportunities. We’re also working to increase consumption of locally harvested sustainable seafood and at the same time, increase profitability of Alaska’s small-boat fishing operations. AMCC’s members include fishermen, business owners, conservationists, marine scientists, working families, and others who share concerns about ecosystem and community sustainability and the significant impacts of human activity on Alaska’s oceans. AMCC’s diverse Board of Directors is made up of Alaskans – many of them fishermen – from coastal communities spanning the state from Southeast to the Bristol Bay. AMCC’s niche in advocating for smart solutions for fisheries and community sustainability has never been more important. AMCC will continue to catalyze meaningful progress with the support of Alaskans like you. Our fisheries are our most valuable resource and we hope to support their health and support fishing opportunities for Alaskans far into the future. One way you can help us maintain the integrity and intrinsic value of Alaska’s coastal communities and ecosystems is by choosing to give through Pick.Click.Give. We’d appreciate your support. In 1992, with support from the Alaska Conservation Foundation, Nevette Bowen, a community organizer and fisherman, traveled coastal Alaska to listen to the marine conservation concerns of commercial, recreational, and subsistence harvesters, and coastal residents. A consensus emerged from these coastal voices and with it, the creation of the Alaska Marine Conservation Council (AMCC). In 1994, AMCC was founded as a voice for long-term, community based marine conservation. Since that time, AMCC has remained steadfast in its commitment to ensuring the role of local coastal residents in decision-making processes, and addressing growing threats to Alaska’s marine ecosystems, including high levels of bycatch, destructive fishing practices, and offshore drilling with insufficient consideration of fisheries resources and habitats. The work of AMCC is guided by the core principle that people are part of, and depend on, healthy and diverse marine ecosystems and are responsible for maintaining these ecosystems. Local Tanner crab vessels steamed out of Kodiak and Old Harbor on January 18th, with high hopes for a successful crab season. We always leave that way, full of hope. Why else would we keep going out? Tanner crab boat, F/V Jamboree, heads out to the fishing grounds. The winter Tanner crab fishery is somewhat unique in that it was designed with input from the community-based fleet. Fishermen wanted managers to factor in safety, equity, and conservation into how the fishery operates. One way managers do this is by using the weather to dictate openings. If the daily weather update for the fishing grounds includes a gale warning, managers delay the fishery for 24 hours. Doing so provides for greater safety and equity in the fishery, as it is dangerous for smaller vessels to travel in rough weather with crab gear on their decks. While it may be an uncomfortable ride for an 80-foot vessel carrying 20 heavy crab pots out to the grounds, it is rarely life threatening. However, for a 42-foot shallow draft seiner, like our boat, it is life threatening and we would have to stay in town. Thus, without the weather stand down, the fishery could be harvested with by a handful of larger boats while the rest of the fleet is tied to the docks. Working together, the fishermen came up with a solution. This year, the season was delayed for three days due to gale winds clocked at up to 106 knots. The fishery was also designed with input by fishermen to have a minimal impact on Tanner crab stocks. Crab pots can only be hauled from 8:00 in the morning until 6:00 at night, thereby reducing the mortality of discarded crab—those that are undersized or female. 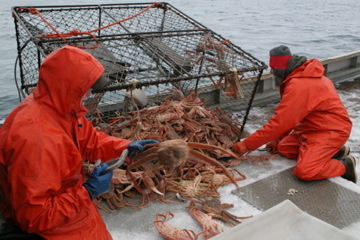 Minimizing the number of times a pot is hauled and therefore how often crab are handled reduces stress on the resource. The daylight-only requirement limits the exposure of discarded crab to colder temperatures in the night. Vessels are also limited to 20 pots, depending on the total allowable catch of crab, which serves to both minimize the impact of the gear on the crab and level the playing field. When the allowable harvest goes up, so does the number of pots the fishermen can use. When the total allowable catch is under 2 million pounds, the limit is 20 pots; as that catch rises, the number of pots allowed stair-steps all the way to 60 pots (when the allowable catch is over 5 million pounds. This year the total allowable catch for the Kodiak Island district is 400,000 pounds, and after a four-year closure due to low crab abundance, fishermen are supportive of the limit and just happy to be fishing. Crew members Jay Lund and Hunter Bigley, two young men raised in Kodiak, carefully sort a pot of Tanner crab on the F/V Patricia Sue. In a town like Kodiak, which is sustained by fishing, there are few opportunities to make a living other than commercial fishing. As community-based fishermen dependent on the health of the fisheries resource to make a living, many fishermen advocate in the fisheries policy arena in support of sustainable fisheries and opportunities for the next generation. We work hard to share both our experience and knowledge of the industry with management bodies like the Alaska Board of Fish and the North Pacific Fishery Management Council. Both of these bodies are set up to provide stakeholder input, and policy makers value the contribution of the fishermen to inform decisions. This process, coupled with the influence of strong science, has led to the world-class, sustainable fisheries that are found throughout Alaskan waters. I’m proud to call this state and Kodiak Island my home, and will continue to advocate for policies that sustain the stocks and provide other families the opportunity to make a living from the sea. For the first time in four years, the commercial Tanner crab fishery has opened, and AMCC is once again offering delicious Kodiak Tanner crab harvested by small-boat, conservation-minded fishermen to residents of the Anchorage and the MatSu area. This will be a short offering, from January 9th to the 19th, with limited crab available for purchase, so order while you can! AMCC has re-opened the search process for an Executive Director after an initial first round of trying to identify our next leader. Outgoing Executive Director, Kelly Harrell, departed the organization after nearly 7 years at the helm. AMCC is offering a rare opportunity to lead a thriving nonprofit organization supporting sustainable fisheries, marine conservation, and strong communities. For more than two decades, AMCC has been a respected force in advancing major policies and advocating for marine conservation. The successful candidate for Executive Director (ED) will demonstrate a strong commitment to this vision and have a proven track record as a highly effective and collaborative team leader with demonstrated fundraising skills. Under the direction of a dedicated Board of Directors and working with a highly accomplished staff, the ED will lead the organization into the next chapter of a successful history. The ED will work with a dynamic board and staff to sustain and increase the capacity of the organization through strategic and annual planning to achieve the organization’s goals. The ED is responsible for all aspects of fundraising, fiscal and operations management, staff development, and program innovation and evaluation. The ED manages an organizational budget of approximately $1 million. The position is based in AMCC’s main office in Anchorage, Alaska. The salary range is $70-80,000, depending on experience. Applications are being accepted now, and will be considered until the position is filled. Please see https://www.akmarine.org/who-we-are/our-team/jobs-and-internships/ for directions on how to apply and a more detailed description. The updated Executive Director job posting can be found here. Please share! An Interim Director has been appointed while our search for a permanent E.D. continues. Our dedicated Board is committed to a successful transition and is working with staff to ensure the organization continues to fire on all cylinders. Washington, DC – The Fishing Communities Coalition (FCC) today applauded Senators Dan Sullivan (R-AK), Lisa Murkowski (R-AK), Ed Markey (D-MA) and Maria Cantwell (D-WA) for cosponsoring the Young Fishermen’s Development Act (S.1323). The bipartisan and bicoastal bill, a top FCC priority, would give fishing communities a needed boost by addressing steep and growing obstacles – including high cost of entry and limited entry-level opportunities – facing the next generation of America’s commercial fishermen. The Senate legislation, which aligns closely with a House version introduced in April by U.S.Reps. Don Young (R-AK) and Seth Moulton (D-MA), would launch the first coordinated, nationwide effort to train, educate and assist the next generation of commercial fishermen, providing grants of up to $200,000 (totaling $2 million annually) through NOAA’s Sea Grant Program. The bill is modeled after the USDA’s successful Beginning Farmer and Rancher Development Program, which is credited with preparing hundreds of young farmers and ranchers for rewarding careers in agriculture. Young fishermen representing FCC members from every U.S. coast recently traveled to Washington, DC to urge legislators to support the initiative. Founded in 1994, Alaska Marine Conservation Council is a community-based, nonprofit organization committed to protecting the long-term health of Alaska’s marine ecosystems and sustaining the working waterfronts of our state’s coastal communities. Our members include fishermen, subsistence harvesters, marine scientists, business owners, conservationists, families, and others who care deeply about Alaska’s oceans. Erica Madison is a first-generation commercial fisherman, and owner of Madison’s Salmon Co. An Alaska resident for 20 years, Erica spent 10 years working in the marine ecology field before making the switch to commercial fishing several years ago. Tell us about your connection to the ocean and Alaska’s wild fisheries. I am a Bristol Bay fisherman. I set-net on the Naknek and Kvichak Rivers. I have a set-net permit and have been connected to this fishery for three years. Why do you choose to support AMCC? I believe in the promotion of healthy sustainable fisheries. I also want to give support to the communities behind those fisheries and that is what the AMCC does. It is a grassroots organization that is not just looking at the fish, they want the fisherman, culture and ocean to be healthy. As a scientist I found that there was too much “species specific” focus. If you want to make something last, you have to take in all of the parts and pieces. If I as a fisherman can be a part of healthy salmon in the future, then I am on board. What part of AMCC’s work interests you the most? AMCC has a lot of great work going on this year. With the upcoming season about to be in swing I am the most excited about the Working Waterfronts project, specifically putting in place a connection between local fisherman and their community. I myself am working with a sea-to-table approach by direct marketing my salmon through Madison Salmon Co. I take pride in knowing that my fish are well taken care of and that locals will know exactly where their fish came from. What do you love most about fishing? I was drawn to fisheries because of my at-sea work in the marine sciences. I would see fishermen from afar as I was counting birds and staring at fish monitors and I always thought, I want to work for myself with a species I understand from start to finish. Fishing lets you connect not only to the species you’re working on but also the ecosystem it originates from and the community it directly affects. What’s happening in the small boat commercial fishing industry that is exciting or encouraging? It is encouraging to see people take ownership of their oceans and rivers again. Closing down mining projects or damn projects that directly affect salmon is a giant triumph for the salmon. If we as as a fleet of small boat commercial fisherman can come together to protect ecosystems, I believe we can have power in other conservation efforts as well. What do you see as the biggest threat to Alaska’s small-boat commercial fisherman? I find it scary when I reach out to my friends in the lower 48 and they tell me about cheap “natural” salmon they buy at the grocery store. There is not enough education about where our food comes from, and that leaves the consumer without information about what they are getting. The commercialization of farmed fish is not not only a threat because it steals market share, it also poses genetic threat to wild salmon stocks and spreads disease. What do you love most about living in Alaska, or in your community? I live in so many different places in Alaska that I sometimes fear I will lose my community or feeling of community, but Alaska’s great because we take in wanderers, seasonals, and newcomers and treat them like family. After my commercial season last year, I met a woman named Kate Taylor who is an accomplished guide in Bristol Bay and runs her own business Frigate Travel. She took me under her wing and taught me how to fly fish. We talked conservation of headwaters and ways to protect the fishery. She even took a day to come out and learn all about commercial fishing and cheer me on in my work. That right there is community. Where in Alaska would you like to visit or spend more time? I feel so lucky to have seen Alaska’s waters so thoroughly when I was doing marine research. I also have a passion for traveling over land, and at some point I will make it from Anchorage to Naknek, hopefully on skis. Connecting two places by foot is pretty special. The White House released its preliminary 2018 budget proposal on March 16. As reported by The Washington Post, the Trump administration is proposing massive cuts to the National Oceanic and Atmospheric Administration (NOAA) budget. Included in those cuts is the complete elimination of the Sea Grant program. FishBiz Program: This program provides financial and business tools for fishermen, ensuring those looking to get into, remain, or sell out of a fishery have the tools to do so effectively. Training Alaska’s fishing workforce: Sea Grant provides Alaskan fishermen with education and training on essential topics such as vessel safety and maintenance, fuel efficiency, refrigeration, direct marketing, and permitting. It has also hosted the Alaska Young Fishermen’s Summit, which has provided critical training to more than 350 young fishermen. Mariculture investment: Sea Grant has invested more than $2.5 million in research and outreach in support of Alaska’s growing mariculture industry. Practical Research: Sea Grant leads research that addresses coastal community priorities, including the “Graying of the Fleet” project that is working to identify and find solutions to barriers to entry for the next generation of fishermen. What can you do about these proposed cuts? NOAA’s budget will ultimately be decided by a congressional budget resolution. Congress typically makes changes to the president’s proposal, so now is the time to let your representatives know how important Sea Grant is to Alaskans. Senators Sullivan and Murkowski have gone on record opposing the cuts to NOAA’s budget, but it’s still critical that they hear from you about maintaining federal funding for Sea Grant. Please call your Congressional representative. Phone calls carry more weight with legislators than emails. Listed below is the contact info for each office, along with talking points to guide your call. I’m calling today to let [elected official] know that I oppose the president’s proposed cuts to the National Oceanic and Atmospheric Administration (NOAA), specifically the elimination of the Sea Grant program. Sea Grant directly contributes to job creation and economic development, the core functions of the Department of Commerce. In Alaska, Sea Grant offers valuable technical assistance to our seafood industry, which employees 60,000 Americans from across the country. Federal funding of Sea Grant goes a long way. Each dollar Sea Grant receives in federal funds is multiplied threefold through strategic partnerships with the University of Alaska and other grant funders. I personally value [name Sea Grant program or service that is important to you, such as the Young Fishermen’s Summit, the Graying of the Fleet research project, food preservation workshops, educational materials and trainings, etc.]. Click here for more information about Sea Grant’s workshops, trainings and programs. Again, I urge [elected official] to maintain funding for Sea Grant in NOAA’s 2018 budget. Thank you for your time. MSA Update: A new Congress may mean big changes for nation’s fisheries laws. Sen. Dan Sullivan (R-Alaska) was recently named chairman of the Senate Subcommittee on Oceans, Atmosphere, Fisheries and Coast Guard for the 115th Congress. The subcommittee, among other things, is responsible for addressing matters that concern federal fisheries; it will be a key player in the ongoing effort to reauthorize the Magnuson Stevens Act (MSA). The Senate has yet to introduce a MSA bill, despite the House passing a bill in 2015, but rumors have been circulating that a draft bill is in the works. AMCC believes strongly in the MSA. Its record speaks for itself: Since 2000, fishermen and managers have rebuilt more than 40 stocks nationwide, while Alaskan stocks under its jurisdiction have thrived since Congress passed the act. We are therefore hesitant, under the current political climate, to advocate for wholesale changes to the law. In our view, many of the issues facing Alaska and other regions could be addressed through increased funding for key programs such as at-sea monitoring, stock surveys, and enforcement; better use of existing funds; and improved application and enforcement of current laws and regulations. Should the Senate decide to reauthorize the law, we are excited to have Senator Sullivan carrying on the “Alaska legacy” by taking a leadership position the process. Since Congress enacted the law, Alaska has always played a lead role in shaping our nation’s fisheries. Under Alaskan leadership, each reauthorization has been a bipartisan effort to improve the sustainability of our fisheries through reforms based upon science and stewardship. And, because of the lead role that Alaskans have played in the process, reauthorization always been an opportunity to directly address the issues facing Alaskan fishermen. In short, each reauthorization of the MSA has made fisheries management better for Alaskan fishermen. To date, Senator Sullivan has proven to be advocate for Alaska’s fishermen, passing legislation that addresses illegal and unreported fishing, while also working to prevent others from undermining the MSA. This track record hopefully indicates the Senator’s willingness to carry the Alaska legacy by putting fish, fishermen, and fishing communities first. To us, that means sensible, smart reforms that will keep this and the next generation of fishermen on the water. These reforms should include improving monitoring and accountability, strengthening community protections, reducing bycatch, and supporting the next generation of fishermen. We look forward to working with Senator Sullivan and the other members of the 115th Congress. Shannon Carroll is AMCC’s fisheries policy director. Contact him at shannon@akmarine.org. Leslie Cornick, Ph.D., led the effort to form AMCC’s Science Advisory Committee, which launches this year. As Dean of Research and Sponsored Programs at Alaska Pacific University, her most recent work includes beluga whale monitoring projects in Knik Arm, Cook Inlet and Bristol Bay. Read on to learn more about Dr. Cornick and the Science Advisory Committee’s exciting work. What is your background? What drew you to AMCC’s’ work? I have a BA in Biological Anthropology, MA in Physiology and Behavioral Biology, and PhD in Wildlife Ecology. I’m a physiological ecologist by training, working primarily on the limits to behavioral plasticity in marine mammals and how they adapt to environmental change. I’ve been a supporter of AMCC’s mission for a long time, so when I took a course in nonprofit sustainability and began looking for local organizations to partner with, I found AMCC to be a natural fit. Why did you decide to spearhead the development of the Science Advisory Committee? In my early conversations with AMCC staff it became clear that the organization was looking to build scientific capacity to bolster their effectiveness in the policy arena. Yet, without a full-time scientist on their staff, fundamental scientific advising was a gap that they needed to fill. I worked closely with Fisheries Policy Director, Shannon Carroll, and Executive Director, Kelly Harrell, to craft the concept and identify need areas. I also wanted to give back to the AMCC in a meaningful way by helping them to move the committee forward. How will the Science Advisory Committee support AMCC’s work? My goal is for the Science Advisory Committee to provide vital input on the current state of the science in key areas so that AMCC can craft policy positions, create programs, and advocate for their constituencies based on the most up to date and best available science. How does the Science Advisory Committee recruit members? What skills are you looking for? We are currently recruiting volunteers to serve on the Science Advisory Committee through a variety of networks, including the Marine Section of the Society for Conservation Biology, the Alaska Marine Science Symposium, and the American Fisheries Society. We are looking for early career or established scientists who are currently engaged in research, to synthesize the current state of the science and provide summaries to AMCC staff. If you’re interested in the Science Advisory Committee, have questions, or would like to submit an application, you can find out more here. This has been an exciting year for the Alaska Young Fishermen’s Network. We’ve celebrated, made new friends, and are laying big plans for the future. It’s been a busy January so far. Network coordinator Hannah Heimbuch and three other Alaska fishermen recently traveled to Victoria, British Columbia, observing the annual meeting of the International Pacific Halibut Commission (IPHC). Heimbuch, along with Keith Bell and Peter Neaton of Homer, and Carina Nichols of Sitka (who was recently appointed to the North Pacific Fishery Management Council’s Advisory Panel), participate in halibut fisheries that span Alaska’s coastline. Young fishermen at IPHC’s annual meeting in Victoria. From left: Carina Nichols, Keith Bell and Peter Neaton. The IPHC process is a robust management collaboration between two countries and multiple gear types, spanning nearly a century. Just as we’ve seen our fleets greying, we’ve seen the same among the leaders and advocates in these important decision-making bodies. As the Network develops, an important part of our mission is giving fishermen an opportunity to experience this and other management and policy processes. Meeting decision makers and mentors in the policy arena, and gaining insight and experience in the process helps expand fishermen engagement and build a new generation of skilled leaders. Also taking place in Victoria this week was a Young Fishermen’s Gathering geared toward supporting young harvesters in British Columbia, the first of its kind. Our group took some time to participate in this important discussion, an event modeled after Alaska Sea Grant’s robust Young Fishermen’s Summit. This gathering has been an excellent time to learn from those in other sectors, and better understand our shared strengths and challenges as North Pacific fishermen. In other developments, Network participants around the state are gearing up to support spring workshops and events, including a fishing finance workshop in Sitka, a ComFish panel in Kodiak and a young fishermen’s happy hour in Anchorage. Details for these events are still developing, but we’re excited to see the Network helping to create regional opportunities that support their fishing businesses and communities. On the creative front, the Young Fishermen’s Almanac is underway and in the policy realm, the Young Fishermen’s Development Program continues to gain Congressional support. In the coming year, the AYFN is going to be growing in some important ways and we’re going to need lots of help and ideas along the way from folks like you. We’re putting together a steering committee and regional AYFN chapters that will help create a vision for the AYFN in the future. If you are a young or a more experienced fishermen that wants to be engaged, please reach out to Hannah Heimbuch. Young fishermen at the Network’s Fishmas event in Homer in December. As part of this growing effort, we are excited to announce the pilot of the Young Fishing Fellows Program! The program will match the goals and needs of young fishermen today with host organizations across coastal Alaska engaged in fishery-related issues and projects. The aim is to provide young Alaskan fishermen with valuable learning, leadership and career-building opportunities through projects focused on fisheries management/policy, seafood business, fisheries and ocean science, marine conservation, or fishing community sustainability issues. We are currently working with potential host organizations to develop and refine fellowship projects and plan to place 3-5 young fishing fellows in the next year. If you are interested in learning more about the Fishing Fellows program, please contact Rachel Donkersloot. If you would like to learn more about developing the Alaska Young Fishermen’s Network in your community, please contact Hannah Heimbuch to sign up and join the Network’s Facebook group. Stay tuned for more information! Hannah Heimbuch is AMCC’s Community Fisheries Organizer. Rachel Donkersloot is AMCC’s Working Waterfronts Program Director. Both can be reached via email or by calling 907.277.5357. Kate Consenstein is an AMCC member and a champion of wild Alaskan seafood. She grew up picking fish at her family set-net site on Kodiak’s west side. Kate is the principal and chief strategist of Rising Tide Communications, an Alaskan communications firm specializing in public relations, strategic communications, and integrated branding. Kate’s work is centered on fishery-related marketing as well as campaigns of all kinds. She lives in Anchorage with her husband and daughter. My family history, my culture and my livelihood are all connected to Alaska’s wild fisheries. A large part of my job is telling the story of Alaska’s amazing seafood and the individuals, families and communities that are supported by it. How did you become involved with AMCC? I learned about AMCC through their early Catch of the Season work in tanner crab, as well as being an excellent collaborator with Alaska Seafood Marketing Institute. Having been raised in a fishing family, I am truly appreciative of AMCC’s efforts to support young fishermen and increase Alaskans’ participation in our commercial fisheries. I wish everyone could grow up with an appreciation for our fisheries and our ocean. What is your most vivid fishing memory? I have so many memories of picking fish with my dad, cutting kelp off our lines, listening to the sounds of whales in the distance. It’s hard to pick. Have you ever participated in Alaska’s commercial fisheries? If so, please tell us a bit about your experience. I grew up spending summers at our family set net site on the west side of Kodiak, where my dad still fishes every summer. My brother seines in Kodiak on his boat, the F/V Atlas. My uncle owned a beautiful wooden boat, F/V Kilkenny for many years, fishing for scallops, halibut and black cod. He still catches salmon and halibut on his hand troller the F/V Godwit. I am excited to see so many young people investing in their own boats, especially young women. I didn’t see a lot of women fishing growing up. There’s a lot of positive role models out there now. Why do you give to AMCC? I give to AMCC because every dollar they receive contributes to Alaska’s waters, fishermen, fishing communities and the things I love most about Alaska. They have top-notch professional staff that work incredibly hard and it is important to me to support them. I know they make the most of every dollar to support efforts I believe in. Seeking Submissions for Young Fishermen’s Almanac! We are proud to announce a new project in the works: The Alaska Young Fishermen’s Almanac! This book-length publication will be developed through the Alaska Young Fishermen’s Network, and feature short stories, art, humor, recipes, poetry, gear/boat hacks, how tos, and more, all while reflecting our fishing traditions. Through this project we aim to better connect young fishermen to each other, and to the skills and stories of their coastal livelihoods. By sharing it within and beyond Alaska’s communities, we hope this unique collection can serve as a cultural touchstone, illustrating Alaska’s fishing way of life to a broad audience. We’ve gathered a dynamic group of young fishermen to lead the development of the almanac, and now we need your help! We’re seeking contributions from young fishermen representing a variety of fisheries and fishing communities across Alaska. Submissions will be considered through the end of the year. Please participate and help us spread the word! Click here to learn more about the almanac and read our submission guidelines. We welcome your stories, your creative ideas and your voices in this new venture! Get in touch with questions, ideas or submissions. Email almanac@akmarine.org or call 907.227.5357. The Alaska Young Fishermen’s Almanac is a project of Alaska Young Fishermen’s Network and made possible by funding from Alaska Humanities Forum. Are you detail-oriented, a lover of numbers, fisheries, and the ocean? Do you want to go to work with a great team of passionate folks, be connected to coastal Alaska and work for an award-wining, innovative nonprofit? Then our Communications and Development Manager position may be for you! As a vital member of the team, this position supports the important communications and fundraising functions of our small, unique non-profit. This position has the potential for long-term growth with the organization and would be a part of a supportive, passionate, and dynamic staff team. This position is full-time. Compensation for this position is dependent on experience and includes AMCC’s generous vacation, retirement, dental coverage, flex holidays, and personal health insurance. The position is based out of AMCC’s Anchorage office. We are an organization that seeks to accommodate an active outdoor lifestyle, families, and fishermen. To apply please send your resume and cover letter to jason@akmarine.org. This position will remain open until filled. Click here for a full description. Alaska seafood is the No. 1 brand featured on all US menus. But the majority of it is exported around the world, according to the National Oceanic and Atmospheric Administration (NOAA). That’s what makes Catch 49 unique. Originally called “Catch of the Season,” this community supported fishery program provides Alaskans with wild seafood harvested by Alaska’s small-boat fishermen. Catch 49 is one of many initiatives run by the Alaska Marine Conservation Council (AMCC), who is committed to supporting local, Alaska resident fishermen and processors, and facilitating access to local, sustainable seafood to fellow Alaskans who share AMCC’s vision for maintaining a healthy marine ecosystem. The Catch 49 program is currently offering Bristol Bay sockeye salmon. Catch 49 allows customers in the state to order a share of the season’s harvest from small-boat Alaska fishermen ahead of time. Customers then can pick up their orders at a designated site in Anchorage, Fairbanks or Homer, about two weeks after the ordering period closes. “Although the program is quite consumer focused, we have had a high level of interest from foodservice operators in Alaska,” says Cassandra Squibb, who is helping to market Catch 49 products. “Not only does each offering come with information about the fishery, but we also can provide the name of the captain, the vessel, and exactly where the fish was caught.” Go to www.catch49.org to order 10, 20 or 45 lb shares of high quality, flash frozen Bristol Bay sockeye fillets.